As the summer draws to a close the smell of the ripe heirloom tomatoes at the farm stand grows heavy. On late summer evenings I like to make what I call the "easiest pizza ever". Growing up when my mom was hurried and pressed to make dinner she would whip us up these cute little pizzas on an English muffin. I tried them a couple of times when the girls were little, but as my desire accelerated for crusty bread and ripe from the vine tomatoes so did my zeal for a little more grown-up version of an easy little pizza. I love this time of year, things are starting to get back in order. I'm concentrating my efforts on catching up on work and planning what's left of this year. Only thing that could make life any better is a ultra tasty, exceptionally easy pizza. 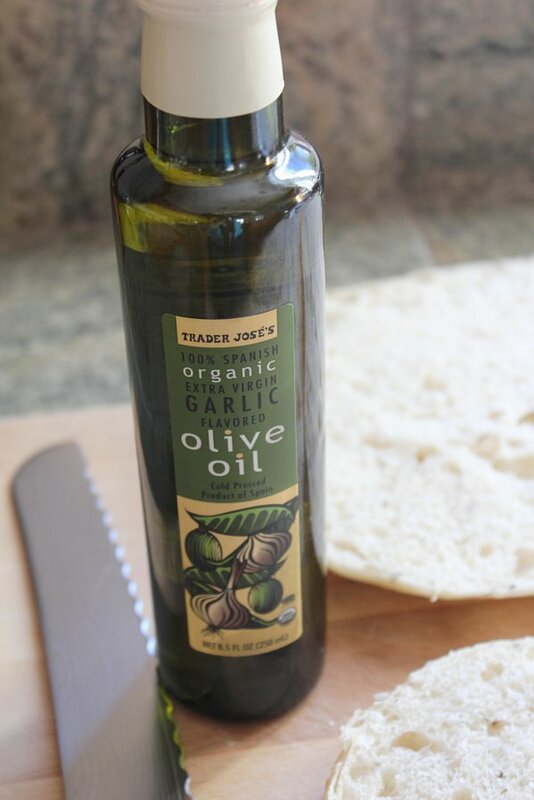 Slice the focaccia bread in half horizontally and drizzle with a couple teaspoons of the garlic olive oil, place both halves on a baking sheet. Cover each half with sliced mozzarella and then place a layer of tomatoes on top, sprinkle with salt and pepper and sprinkle basil over top. Bake for 15 minutes or until cheese is melted. Cut into squares. Sometimes I will make half with fresh tomato and half with pepperoni or whatever the girls are feeling like at the time. My heart hurts every time someone writes about summer drawing to a close. This 'pizza' helps a little. It looks like sunshine and summer. My hubby thinks that pizza is cheese and sausage. He's in for a surprise, when I make your gorgeous pizza for dinner soon. I probably won't be able to find the heirloom tomatoes now, but my neighbor's garden is still producing tomatoes. thanks for the great idea. I have missed feelings about this time of the year. Summer is over, which makes me sad, but then again I do love autumn. It's been so crazy busy here and easy and fast recipes are exactly what I'm looking for. Your pizza looks amazing and I could also eat it for lunch or even breakfast:) Hope you are doing great, hugsies. Mine too Katty! It makes me sad the long days of summer are over, but not the punishing heat. Looking forward to a blanket in the evening. I did the same with ciabatta ;-) Really enjoy yours with these beautiful heirlooms. i love this! it's like a caprese salad, on bread! you improved caprese salad. well done. This is like a grown-up version of a mini pizza on an English muffin. Brilliant! I will be making this for my family one day soon. Hope you are having a great weekend!